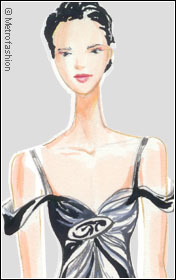 Smart modern style trends such as metallic, one shoulder, empire, and fuschia appear in Holiday & Resort 2009 2010 collections. 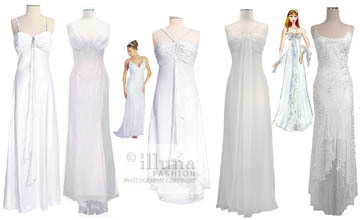 Designer evening dresses from famous names like Sue Wong, Rachel Pally, and Tricia Fix. Little black dresses from San Francisco Fashion Week for Fall Winter cocktail parties. Fall Winter Collections from Palace of Fine Arts in San Francisco. Metrofashion 21st Century Fashion Front Row Photography. Photos: ©Metrofashion.com All Rights Reserved. Mini Strap Jazz Party Dress with matching soft shoes for lounge affairs. Evening cocktail dresses highlight the classic looks of special occasion fashions. Black party dresses matched with colorful patterned, metallic, and leathered handbags for the city chic look. Highlights from San Francisco Fashion Shows. Christina Hurvis, known for classically inspired Parisian couture, gave a nod to Athens during her inaugural San Francisco Fashion Week Spring Collection; amongst the flowing silk chiffon gowns of ivory and white there appeared a one shoulder silhouette fit for the goddess Athena herself. Little black dresses from San Francisco Fashion for Fall Winter cocktail parties.